Southern California's longest running political and public affairs interview program. Lt. Gov. Newsom talks Prop 63, a gun and ammunition control initiative on California’s November ballot. Lt. Gov. Gavin Newsom strongly defended his gun and ammunition control ballot measure, Proposition 63, saying it goes "much much further" than the package of gun control bills passed recently by the California legislature and signed by Governor Jerry Brown. 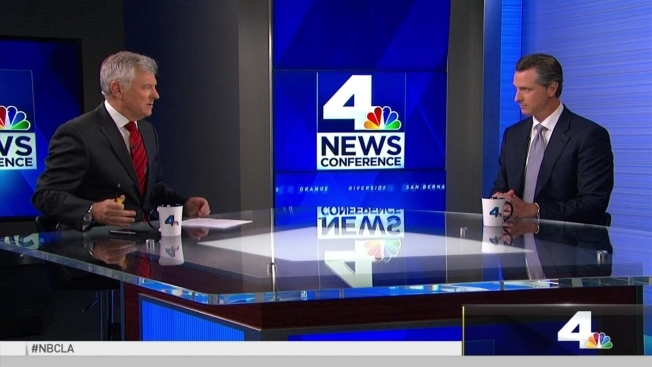 "The legislature hasn’t acted as it could on gun safety and now the people will have a chance to do so," he said in an interview broadcast Sunday on NBC4's "News Conference" program. Newsom’s gun control ballot initiative had been criticized by Senate President Pro Tem Kevin DeLeon (D-Los Angeles) as being "irrelevant." DeLeon last month said the legislature had "taken care of business" and implied that Proposition 63 was simply part of Newsom’s effort at winning election to governor in 2018. "I don’t know the motivation for politicians to say things like that, it is unfortunate" Newsom said of DeLeon's remark. "I care deeply about this issue ... it is consistent with my passions and I think consistent with the will of the people of this state." DeLeon had included a provision in one bill regulating ammunition sales that would allow for it to supersede the ballot measure’s provision on that issue. The move was described as "sickeningly cynical" by a spokesman for Proposition 63. Newsom indicated he might challenge the law in court. "We think that is simply unconstitutional … I think the will of the voters should trump the determination of an individual or two in the legislature," Newsom said. Proposition 63 would require stringent background checks of those purchasing ammunition and would ban high-capacity ammunition magazines. It also includes provisions by which illegal guns can be confiscated by those convicted of a felony. Another element also increases penalties for stealing a gun. Under Proposition 47, passed in 2014, the stealing of a weapon valued at $950 or below can only be charged as a misdemeanor. Proposition 63 would increase the penalty to a felony.